New York, March 4, 2014 – Richard Meier & Partners to design first project in Bogota, Colombia. The Vitrvm development will consist of two towers with a total of 36 apartments and will be located along Septima Avenue in the north section of the city. The project is contextually inspired by the beauty of its immediate surroundings and it aims to reflect and to engage the beautiful gardens and large trees at the Chico Park and the Seminario Mayor. Vitrvm, the first project in Colombia designed by Richard Meier & Partners is located on a prominent site along Septima Avenue in Bogota. With impressive views towards the city and in direct relationship with the secluded Seminario Mayor, one of the largest and most important seminaries in Colombia, this 13 story residential project consists of two towers. The site is surrounded by the greenery of the nearby mountains and the landmarked Chico Park. A ravine and water gorge delimits the property to the north and serves as a buffer and separation to the neighboring property delineating the unique angular shape of the site. Jorge Estrada, Owner and executive director at Icono Urbano, comments: "When we started our Vitrvm project, we were looking for an architect who could embrace and respect the unique characteristics and qualities of our site. It is very gratifying for us at Icono Urbano to develop this important project with the prestigious firm of Richard Meier & Partners Architects. Their expertise, dedication and design quality is reflected in the project. The sales of the apartments have been very strong even at an early stage of the project and we have no doubt that Vitrvm will become a reference project for Colombia." The two towers are distinguished by singular forms, each with unique expression and in dialogue with each other. Tower 1 is characterized as a prismatic structure distinctively articulated by folds, planes and carved surfaces, while Tower 2, an almost rectangular shape is defined by two solid punctuated planes. The massing of both towers responds to the internal program, the relationship with the immediate context, the views to the exterior and the privacy required for each unit. With two apartments per floor on Tower 1, the floor plate is bisected through the middle to generate two distinct and large units with four bedrooms, each with a unique character and enjoying views towards the vibrant city valley and the tranquil scenery of the ravine and beautiful architecture of the old seminary. Both units enjoy ample morning and afternoon natural daylight, have direct access to private elevators and share a service core. In contrast to Tower 1, Tower 2 has only one apartment per floor comprised of three bedrooms and a studio. The floor plate is organized in a linear configuration with the living areas and studio located towards the north with full exposure to the landscape that surrounds the Seminary and the distant mountains to the East. 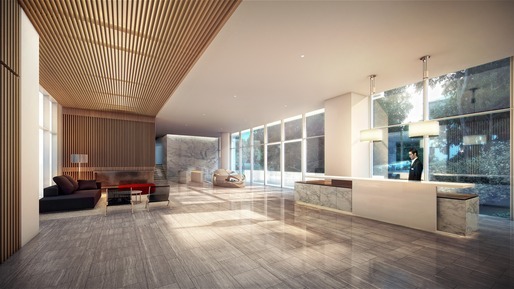 The lobby which is located on the second floor and preceded by a generous porte-cochère is shared by the two towers. On the first floor, there are a series of amenities including a multipurpose room, an indoor swimming pool, a gymnasium and a children’s playroom. Additional landscape elements enrich the surrounding exterior zones at ground level as well as the roof deck and public terraces. At the top of the building, a large open roof deck is subdivided into two separate private terraces for the penthouse units and a public terrace. Richard Meier, comments: “The interiors of Vitrvm will be complementary to the architectural concept incorporating a palette of rich materials with subtle textures and colors. Natural materials such as stone and wood and earth tones of smooth and textured surfaces will be in dialogue with the light color palette of whites, grays and glass.